The West Coast classic, 93 ‘Til Infinity, has been released as a Deluxe Reissue by the acclaimed Get On Down label, who continues to show their enduring respect for classic hip-hop with this amazing tribute to Souls of Mischief. The impact that Souls of Mischief had on the development of hip-hop has been tremendous. They have been lauded by everyone from Vampire Weekend to John Mayer to Just Blaze and to Kanye West as having been groundbreaking and influential in both music and fashion. In order to commemorate the 20th year release of 93 ‘Til Infinity, Get On Down has made 500 legendary Souls Super Bundles that are packed with tons of exclusive content. Several bundle options are available and will be shipped on March 7th, but pre-orders are available now. Every Souls Super Bundle is packed with great content. It contains the Hiero Light Box, consisting of a commemorative box with a 4.5 inch blue LED-lit Hieroglyphics logo that is activated by a hidden button on the case. The iconic “third-eye” logo glows in radiant neon blue when the button is pushed. The Hiero Light Box also holds the Souls of Mischief Music Book in a distinctive slide-out drawer emblazoned with the Soul’s graf-style logo. 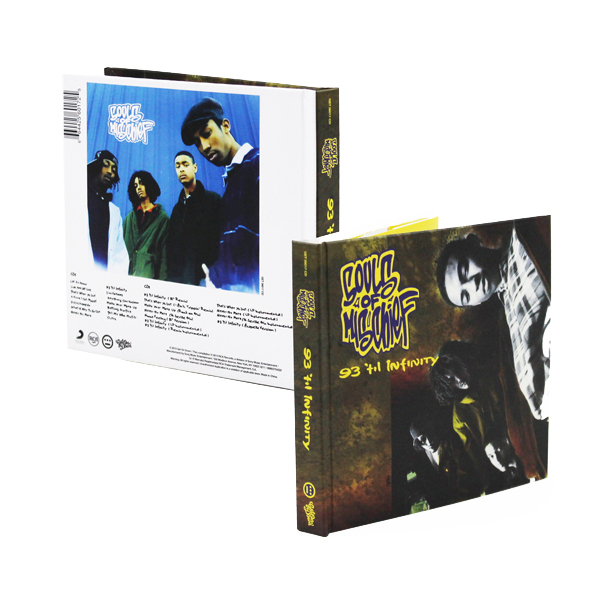 The super bundle also contains a 2-CD Souls of Mischief Music Book package is a unique CD casebook that plays the song “93 ‘Til Infinity” when the cover is opened. It houses two CDs which include the full album plus 11 extra remix and instrumental tracks (8 never before on CD, including exclusive “93 ‘Til Infinity” a capella which has not been previously released in any format). 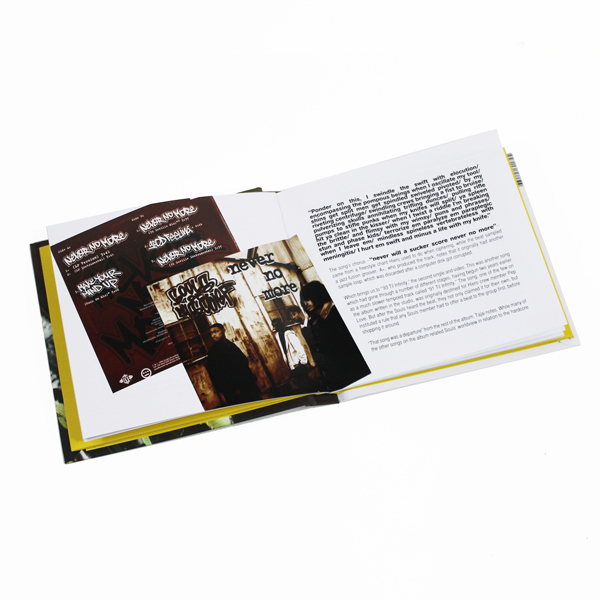 It also includes 36-pages of liner notes comprised of images and group interviews. A 2-LP deluxe gatefold edition of 93 ‘Til Infinity is included in the super bundle, as well as an exclusive t-shirt available in black or white. A Standard Bundle will also be available, which includes all of the above, sans t-shirt. Please contact Michelle or Rory if interested in talking with Souls of Mischief. Starting with their landmark debut ’93 ‘til Infinity, Oakland’s four-person rap group Souls of Mischief has blazed the trail for hip hop’s evolution. Members Tajai, A-Plus, Phesto, and Opio have left their mark sonically, lyrically, and stylistically on Kanye West, Just Blaze, Big Sean, Big K.R.I.T., P. Diddy, Vampire Weekend, John Mayer, and many more who have cited them as cultural icons and influencers. Souls is also credited as having pioneered the independent label movement when they started Hieroglyphic Imperium Records in 1997 following their departure with JIVE Records, creating the infrastructure blueprint for other succesful independent hip hop labels. Co-founders of the Hiero label also include emcees Del Tha Funky Homosapien, Casual, Pep Love, and producer Domino. Souls’ also forged hip-hop’s relationship with the skate, surf, and snowboard communities after iconic skate brands included their music in their VHS videotapes in the mid-90’s. The group’s creative output and legacy as a whole continues to thrive, and they show no sign of stopping. In 2013, on the 20-year anniversary of ’93 til Infinity, Souls created a documentary film about the landmark album, embarked on a 50-city “Still Infinity Tour,” released a joint 20th anniversary limited edition tee shirt capsule collection with Ecko Unlimited, and are currently working on their next project.